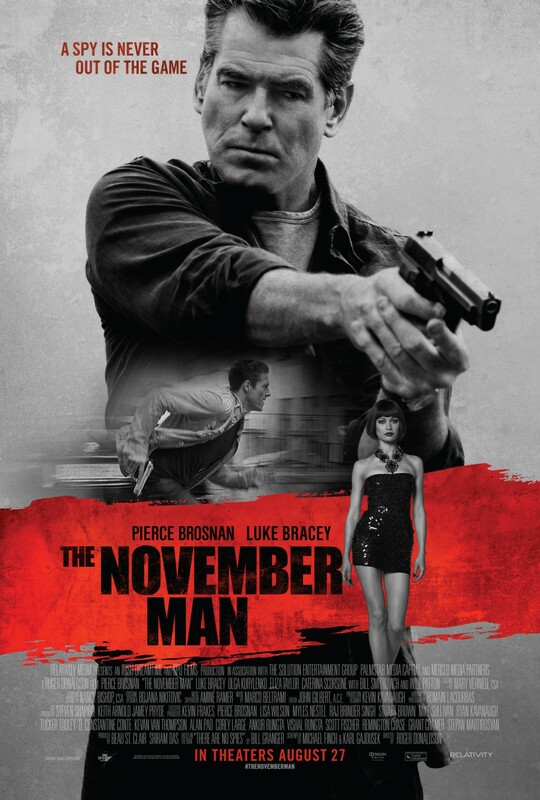 The November Man is an upcoming spy thriller film based on the novel There Are No Spies by Bill Granger, which is canonically the seventh installment in "The November Man" series of books, published in 1987. It stars Pierce Brosnan, Luke Bracey, and Olga Kurylenko with the screenplay written by Michael Finch and Karl Gajdusek. The film is directed by Roger Donaldson, known for his most notable works Species, The Recruit and The Bank Job. He previously worked with Brosnan in Dante's Peak. Beau St. Clair once again teams up with Brosnan to co-produce the film. When Pierce Brosnan retired from playing the role of James Bond in 2005, it was reported that along with his business partner, Beau St. Clair, through their Irish DreamTime production company, he will be producing a down-to-earth spy thriller based on Bill Granger's franchise called "The November Man", focusing on one particular novel in the series titled There Are No Spies, with shooting was scheduled to begin in 2006. The project, however, ended up either being cancelled or was put on hold in 2007, as there were no news or any sign of an action coming out of that direction. But, Brosnan decided to keep the screen rights to the novel which would permit him to produce the film adaptation of the book.